It’s been nearly ten years since Stefan Golz and two of his friends started their own fashion label. They wanted to call it Remoto, after the Spanish word for remote. But the name had already been taken. So they swapped the R for a W. And that’s how Wemoto was born. The name does not sound Spanish, nor does it give any clue that its founders hail from the region of Rhine Main Area, in Germany. The first Wemoto products were skateboards and t-shirts. 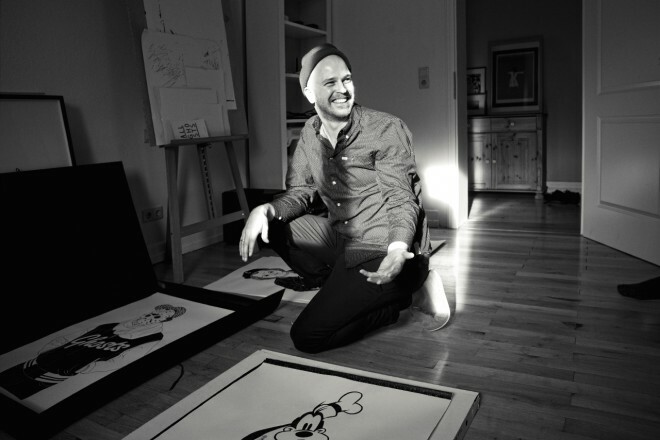 Golz, the label’s creative director, had started his career designing the bottoms of skateboards. Inspired by his early role models, skateboard designers Sean Cliver and Marc McKee, he soon developed his own style. Charlie Chaplin, Albert Einstein, Karl Lagerfeld, Morrisey and Tupac are among the iconic figures that have been portrayed in Wemoto’s past collections. They have since become signature products and collector’s items. We met the 35-year-old artist and designer at his home as he prepared for his solo show, All Ghosts, which opened at Saarbrücken-based gallery Neuheisel on November 10, 2012.